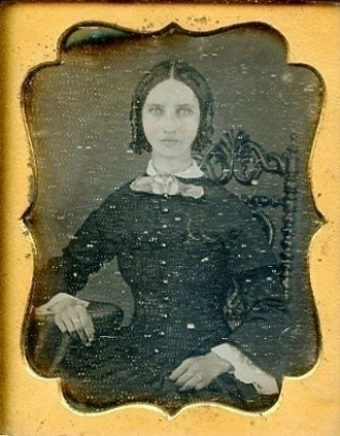 A 1/9th plate daguerreotype, increased about four times. When my reclusive uncle died in the Summer of 2007, the East Sussex cottage that had been in our family for generations was left to me. I was familiar with the property from childhood visits when my grandparents lived there, but hadn’t been to the area for over twenty years having just retired from the military. Thinking perhaps it could be used as a rental property, I made the trip down to dispose of my uncle’s possessions and see what repairs and renovations the old place required. Going room to room with a clipboard and pen I made a list of what I thought should be done. As I passed from the kitchen, through the dining room and into the parlour, I wondered if perhaps any of the walls could be removed to open up the space. Between the parlour and dining room were built in shelves with a fairly nice collection of old books. On the top centre shelf, up by the ceiling, was a collection of curios I could recall from my childhood visits; dust lay thick upon the ceramic ladies, soldiers, dogs and horses. Whether I was going to take the wall down or not, I definitely needed to clean off that shelf. Once the curios were all in the kitchen sink, I proceeded to wipe the shelf, and realized it was only about half as deep as the others. When I pushed on the back board it shifted, then fell forward. 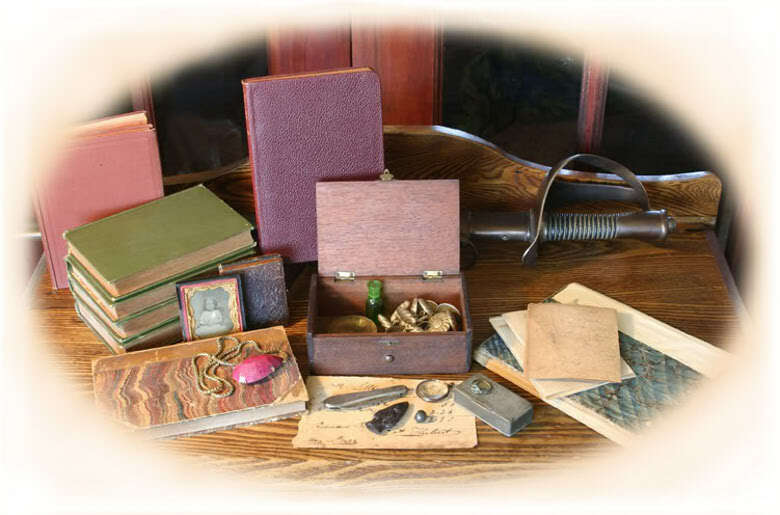 What lay behind were bundles of letters, several notebooks, a ledger, numerous diaries and a small wood box. Within the box I found; a badly damaged brass compass, an ancient bronze ring, a handful of interesting silver buttons, a small lead ball flattened on one side, a black stone arrowhead, a decorated matchbox, a small green bottle, a remarkably large rough cut red stone on a gold chain, a silver pocket knife, a scratched monocle, and a piece of material with intricate embroidery which unfortunately was falling apart. Spreading them out on the dining room table, curiosity piqued, I began to read the diaries thinking they would just contain the usual mundane entries one would find in a person’s commonplace book. Instead I found tale after riveting tale, supported by letters and other ephemera such as faded photos, notes and brittle newspaper clippings. I cannot, of course, verify any of these tales and have to wonder at the fantastic deeds of my ancestor. I often wish my life could have been even a fraction as exciting. When I sit by the fire in the parlour of my cottage, having decided to keep the place as I found it and split my retirement between here and the family property in Canada, I re-read the diaries and letters, and marvel at the notebooks, piecing together more adventures.